Yesterday I reviewed the Bond Travel Gear Field Journal so today we are going to tackle the Bond Travel Gear Travel Wallet. The Travel Wallet is a nice A6 size in Multicam Black. 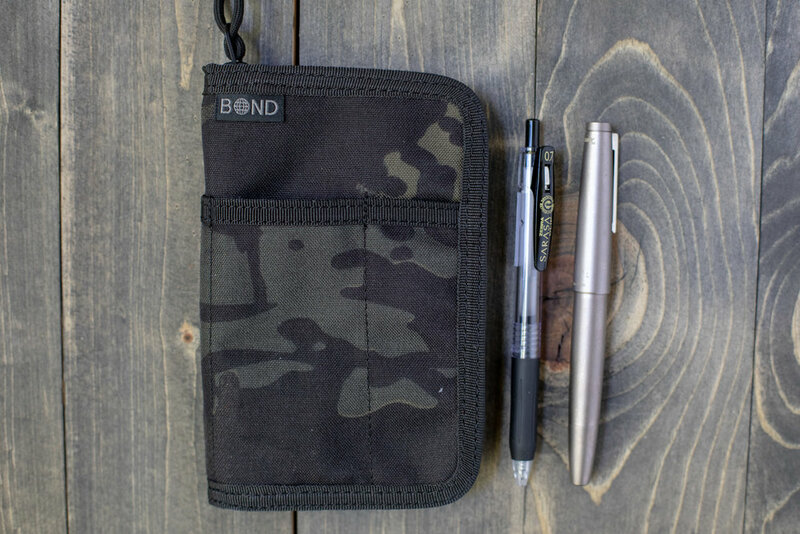 It utilizes RFID blocking fabric, holds pens and pencils and includes a Tomoe River 68gsm pocket notebook. It measures: 4.5 in x 6.5 in x 0.75 in. I don’t use a lot of A6 notebooks since they usually aren’t fountain pen friendly, but Tomoe River paper is perfect for fountain pens. The front includes a pocket divided in two. The back of the wallet includes a pocket with a velcro closure. The inside has a mesh pocket as well as some credit card and passport pockets behind. The Tomoe River paper behaves just as well as in the A5 journal I reviewed yesterday. It handles markers, fountain pens, pens and pencils well, without any bleed through. Overall, I really like this travel wallet. I love that you can buy notebook refills for the wallet that come in a pack of three. I think I will end up giving the wallet to my hubby though. He’s been doing some search and rescue training, and this type of wallet is perfect for keeping a notebook, pen and some tools with him while being durable enough for the harsh weather. As soon as he saw it he tried to steal it, but I made him wait until I was done reviewing it before letting him have it. Disclaimer: This product was provided by Bond Travel Gear for the purpose of this review. All photos and opinions are my own. There are no affiliate links on this page and this post is not sponsored in any way.